That could be your family tree search title, Irish immigrates coming to Boston, Massachusetts. Yet, if that is your case, there is a database (by Boston College) now available online with the advertisements placed in the Boston newspaper ‘Boston Pilot‘. 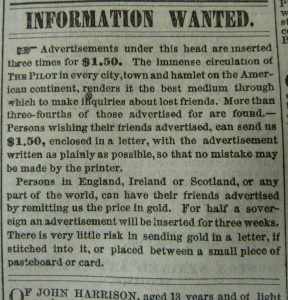 From October 1831 to October 1921 (90 years) the Boston Pilot newspaper printed a “Missing Friends” column with advertisements from people looking for “lost” friends and relatives who had emigrated from Ireland to the United States. This extraordinary collection of 41,249 records is available as a searchable online database, which contains a text record for each ad that appeared in the Pilot. 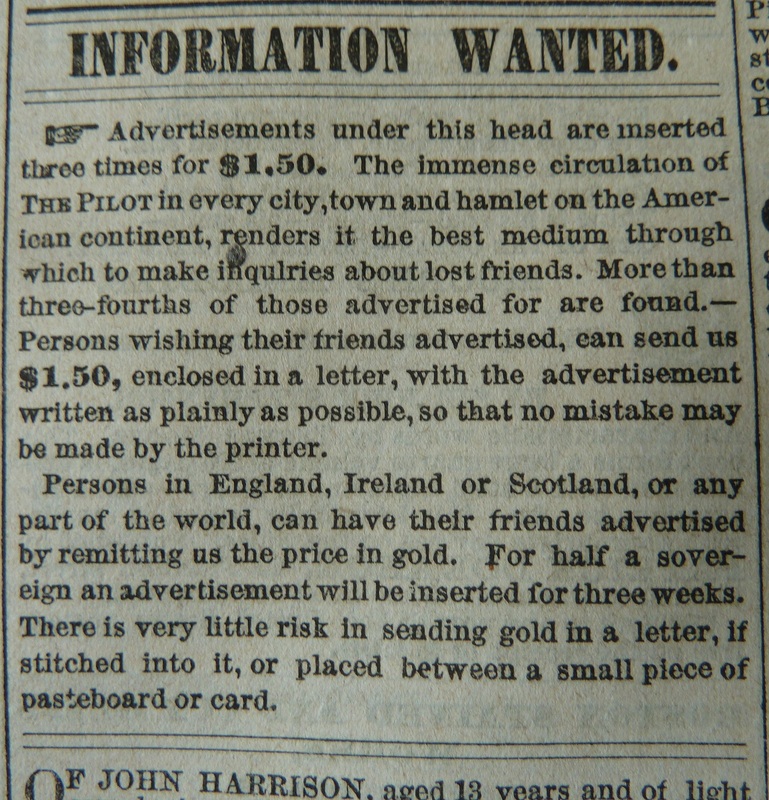 These advertisements when they started in late 1831 became popular right away, were widely used, and increased the paper’s circulation nationally and abroad, including Ireland and Australia. 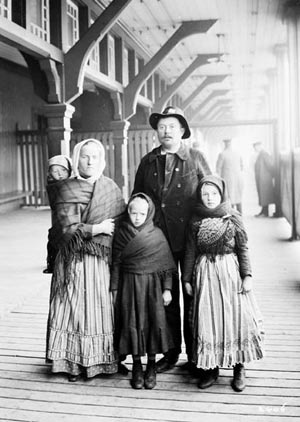 Coming to a new land, many of the Irish immigrates were confused and even could get lost. that was the purpose of the advertisements to get friends and family back together. Some of the advertisements are basic, simple with not much details other than dates and name. Those dates could be of great assistance to you in your research. Yet, many other advertisements are quite detailed, with such information as the parish in Ireland the person was from, when did they leave Ireland, the person’s occupation, and other family members’ names. Each advertisement is different. The cost for the advertisement being printed three different times was $1.50. Use the advanced search box, fill in what information you do know. Remember to try different surname and given name spellings. True, there will be much you do not know but hopefully, can discover. 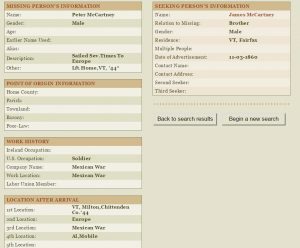 After starting the search a list of names and some information will appear. There will also be some various spellings done. 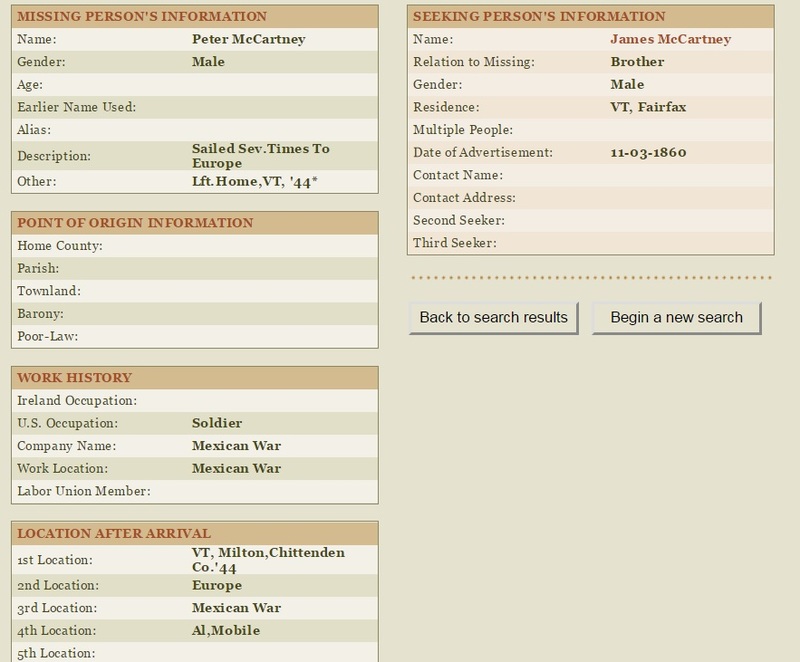 Click on any for further information to see if this is the right ancestor. Note that many of the new Irish immigrates did not arrive solely at the Boston port. They could have arrived via New Orleans, Baltimore, New York, etc. Most direct relatives placed the advertisements (parents, sisters, brothers) but also in-laws, cousins and nephews / nieces placed advertisements. Occasionally you will also see rewards offered for information on the location of an individual. The information was transcribed from the actual newspapers, so it is easy to read. Photos: Irish Immigrates; James McCartney looking for brother, Peter McCartney in 1860; and Placing an Advertisement.